A good logo is synonymous with the brand it represents. Think about iconic brands such as McDonald's or Apple. Their logos are like an instantly recognizable shorthand for the business itself. A logo is essentially a symbol used to represent a brand. Dig deeper and you’ll find that many logos have a hidden meaning, often something that relates to the company’s backstory or a clever visual pun. After all, branding is all about storytelling—it’s how humans connect. But there’s another element that makes up the story of a logo: Its color. 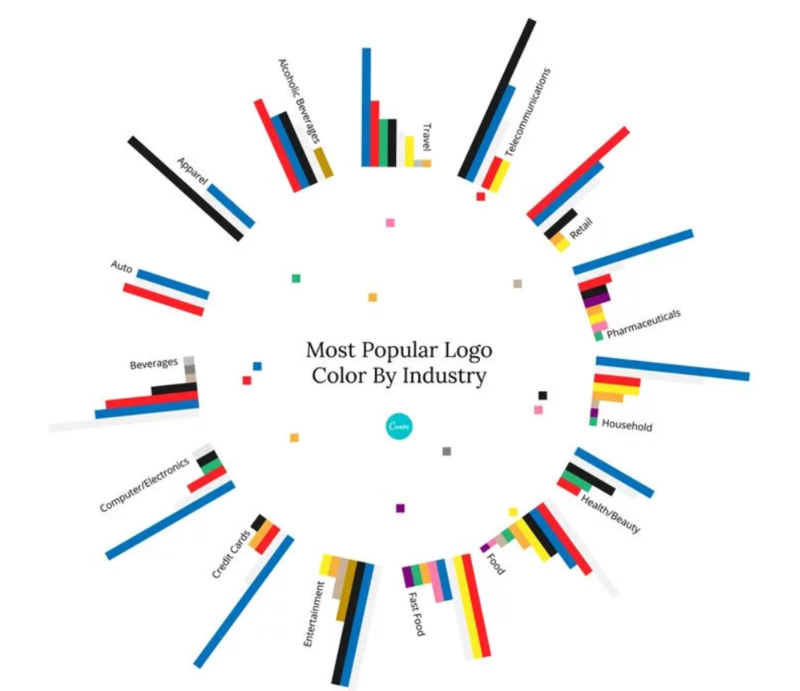 A logo’s color can say a lot about a brand. For established brands, a color can be intrinsically linked to the business’s identity. Think of Starbuck’s famous white and green coffee cups or Cadbury’s iconic purple wrapping. And for new brands, their logo color is an attempt to position their business with their desired customer. In this article, we’ll take a look at how big-name brands use color in their logos, dive into the patterns revealed by popular logo choices and take a closer look at the big businesses that think outside the square. One reason people create logos in the first place is that visual recall is a powerful thing. And that’s exactly why we’ve put together this logo color wheel—at a glance, you can see exactly how big-name brands use color. In their research on color differentiation in the marketplace, Labrecque and Milne highlighted how certain industries frequently use particular colors. For instance, they found that blue is used in over 75% of credit card brand logos, and 20% of fast food brand logos. Red, meanwhile, is found in 0% of apparel logos—but over 60% of retail brands. For consumers confronted with advertising thousands of times a day, these visual cues can be an unconscious message about what they’re being sold, and by whom. In researching this article and infographic, we first looked at the logos of Fortune 500 companies. Here we noticed one prominent trend. 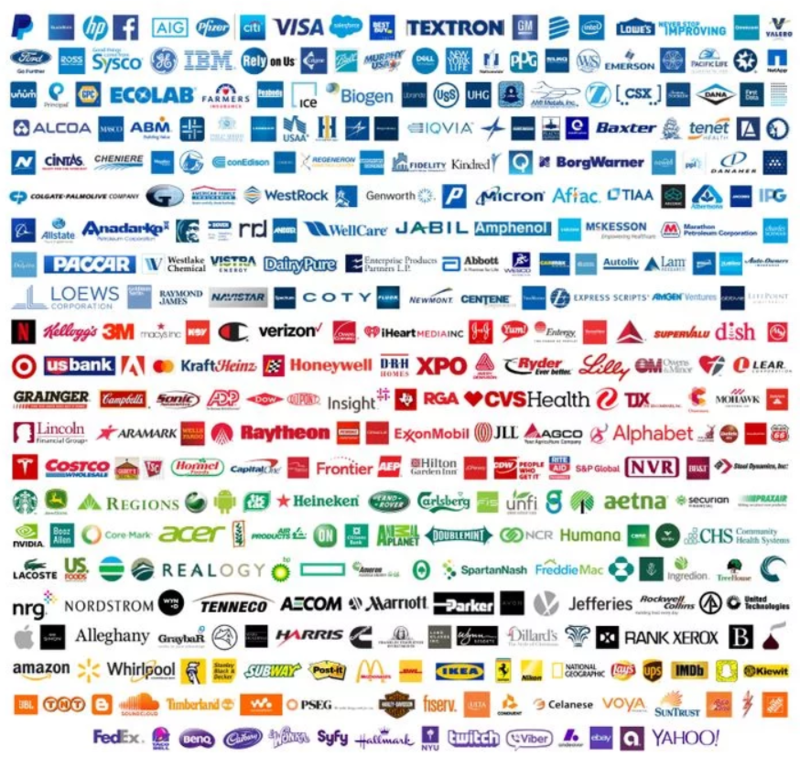 Blue is by far the most popular choice of logo color for these companies. It’s easy to understand why blue logos are such a popular choice. Blue is an inoffensive color, a safe but sophisticated hue. And for companies that wish to convey security—say, those in Finance, Tech, Health or Insurance—blue does an admirable job. Red, on the other hand, is a bolder choice for a brand. Yet it came in as the second-most popular choice. In the Fortune 500, there’s a clear link between the Food and Retail industries and a red logo—backing the research on color differentiation by Labrecque and Milne. Purple pops up here and there in the Fortune 500, while pink doesn’t feature at all. 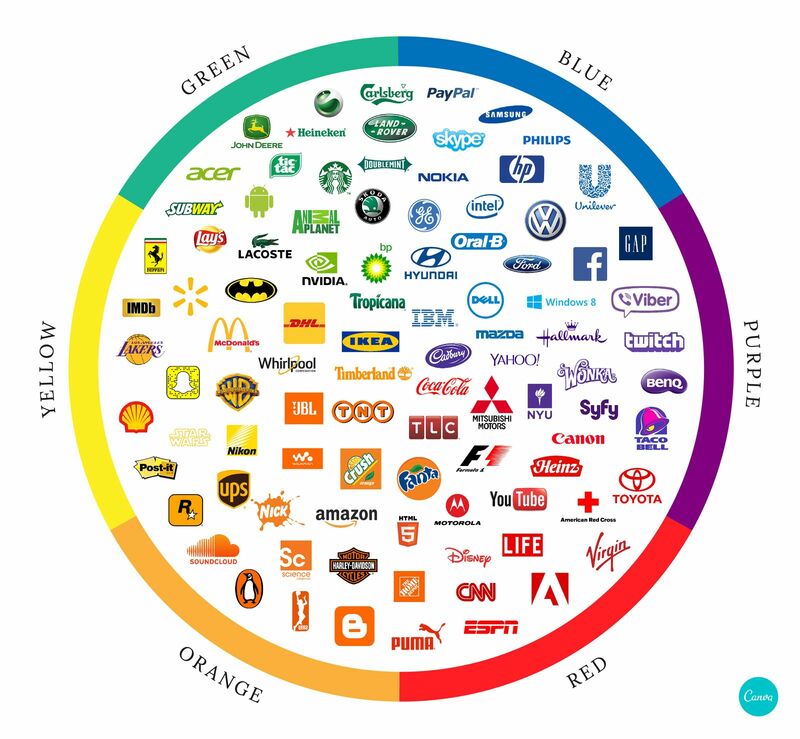 It’s impossible to talk about logo colors and branding and not mention color psychology. This area of study looks into the relationship between certain hues and human responses. Proponents of color psychology believe you can use the theory to trigger particular behaviors in customers. Without a doubt, researchers and marketers have picked up on patterns in human responses to colors. But none of these are watertight: One person might think of red as an exciting, appealing color—and the next person might associate it with blood and gore. Context and the intended audience is essential. Black can be stable and dependable in one context, or edgy and rugged in the next. And factors like culture, gender, and age mean different colors are perceived in various ways by different people. 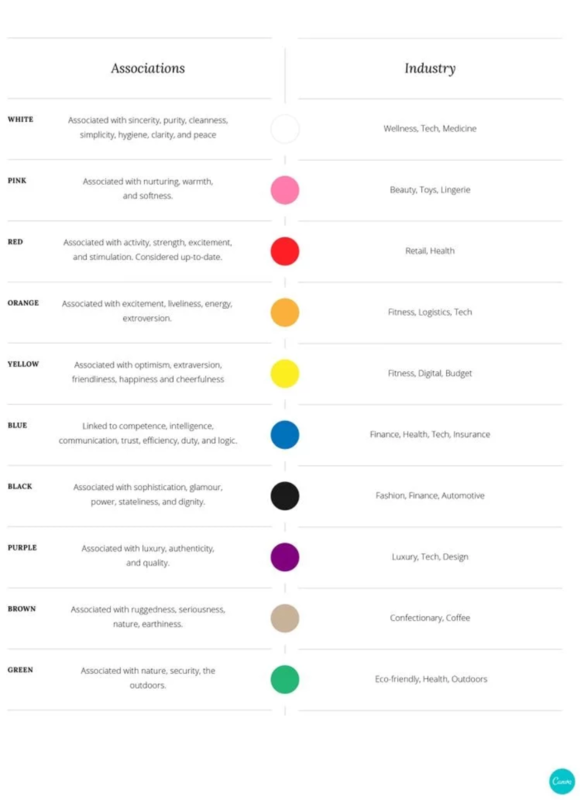 In other words, color psychology isn’t black and white. The lesson here? There isn’t a color that will automatically guarantee success for your brand—but choosing the wrong color can mean your brand is overlooked by your target market. There are, however, strong associations with particular colors in the mind of consumers. These flow both ways—the association between orange and energy might not be inherent to the color itself, but instead is a result of the fact that it’s so often used by brands who want to convey this message. Consumers see this color and know, subconsciously, that there’s a subtle message being conveyed. In this way, color psychology becomes a self-fulfilling prophecy. There is also a physiological aspect to color. Think about when you see a fluorescent sign: Sometimes the color can be so bright that you have to squint. There’s no denying that certain colors are bold and eye-catching, while others are more subtle and gentle on the eyes. Certain companies use this to their advantage—for example, McDonald’s, whose logo is frequently seen in crowded foodcourts or as a Drive Thru destination on the road. In these situations, the bright yellow of the golden arches acts as a siren call. Logos aren’t immune to trends. Many brands update their logos every five years or so, allowing them to stay on top of current trends, while also staying true to their core brand identity. Think about your business goals when deciding whether or not to follow logo design trends – if you’re creating a small business drop-shipping fidget spinners, then it makes sense to follow trends; but if you’re looking to create a business that’s around for decades, aim for something timeless. Let’s take a closer look at the associations commonly brought to mind by colors—and backed by research. Keen to learn more about logo design? Read the full article by Canva here. This article is written by Amelia Marshall on Canva here.